Our A50 Filament-Tape consists of a PP foil, on one side impregnated with an anti-adhesive agent, coated with a very aggressive glue. The tensile strength of the tape is achieved by a glass-fibre reinforcement. Tape A50 is resistant against moisture, thinned bases and acids. 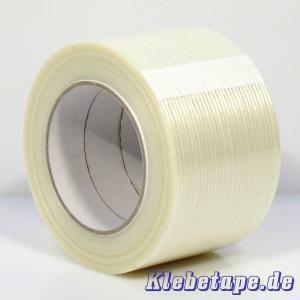 The highly tear proof tape A50 is used for securing of packages, pallets, metal and plastic tubes, as well as for bundling of oblong objects. It is securely bonding with cardboard. Removing of the tape is not possible, without destroying the carton, which is a reliable protection against theft and manipulation.